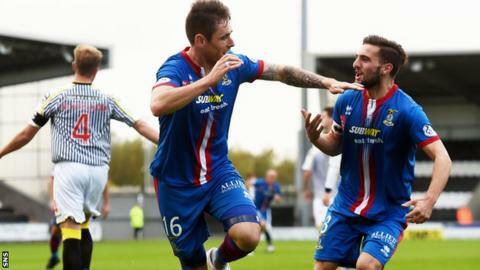 A Greg Tansey penalty gave Inverness a slim victory on their last trip to St Mirren. Inverness manager John Hughes believes their Scottish Premiership form can give them the confidence to go all the way in the Scottish Cup. The Highlanders lie in second place with 29 points, and Hughes is dreaming of a Hampden final in May. "We're more than capable of winning it, trust me on that, more than capable," Hughes told BBC Scotland. "I think that the accumulation of points that we've showed in the league prove that." Inverness went close to lifting the League Cup last season but lost on penalties to Aberdeen in the final. The club made headlines around the world when when they knocked out John Barnes' Celtic in 2000, but the furthest they have gone in the Scottish Cup is the semi-final stage in both 2003 and 2004. "Having had a taste of the League Cup the season before and what it did for the club and the community, it was a good feeling, so we want to keep that good feeling factor about the club," said Hughes ahead of Saturday's match with St Mirren. "The league position at this moment in time shows we hold no fear for anyone. "I'd like to think the cup run last year would give us a bit of inspiration. We all want to be walking out at Hampden on a sunny day in mid May. Walking out there proud as punch representing your team, that's the pinnacle. "Sometimes in the cup it's on its day. They're playing with a great enjoyment, and a freedom, and they're enjoying their football." In stark contrast to high flying Inverness, St Mirren are struggling at the bottom end of the table. Hughes though feels their league form will count for little in the cup. He said: "Because it's a cup game and not a league game I feel that might just free them of any anxiety in their game. "I've noticed that Tommy's started to play three or four of the young kids and that's another problem for us because I feel young kids are free of any tension in their game, they're very unpredictable and they just go and play off the cuff, and that could be a problem to us. "They're not a bad team, they're going to win eventually. "We just need to look back to the last time we beat them, they were a better team than us for the first half. "We got a penalty and went in 1-0 up but St Mirren were the better football team and controlled the game, and it wasn't until young Christie went off that we went two banks of four and one up front and kept a solid shape and played on the counter attack. "So we have to be much improved right from the kick off on Saturday."